Yes, you read it correctly. There will be a makeup training class for all of you “I don’t know how to wear makeup” folks. I’ve got you covered, so get ready to get GLAMMED OUT! Seats will go fast, so get your tickets today! Holla! 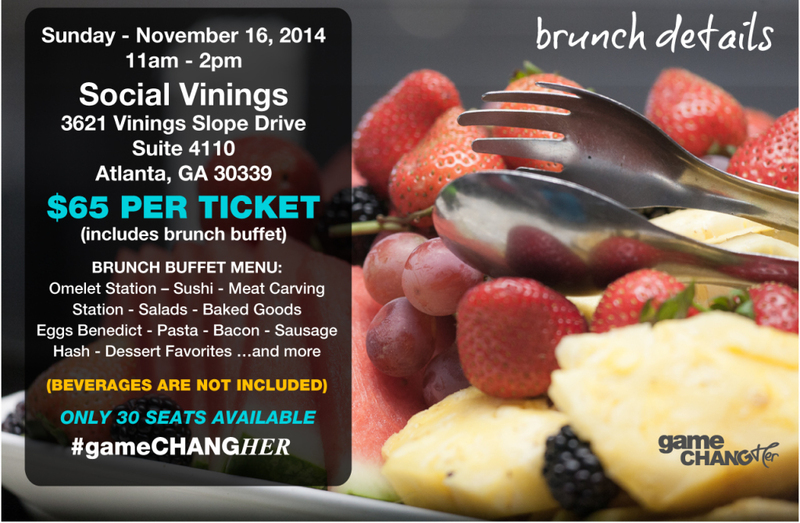 The Game ChangHER Brunch Series is a bi-monthly (every other month) event designed to create a space for for powerful women to share cuisine, connections and conversations that focus on REAL WOMEN. REAL BUSINESS. REAL LIFE. This event was designed to foster authentic personal and professional connections in an intimate relaxed environment, thus seating is limited to 30 women. Tickets go quickly, so don’t delay your purchase. Meanwhile, you can keep up with this and other Game ChangHER events by joining my mailing list. For those of you who are just not that much into the glitz, this Glam Class was designed especially for you! It is designed to teach you EXACTLY how to apply makeup for all the right occasions. If you already know how to wear makeup and look your best, then ask yourself if you can be “red carpet ready” at a moments notice? This class is quintessential for every brand builder! Get your tickets today! CHECK OUT THE SPONSORSHIP PACKAGE HERE! Then email me at EVENTS@JaiStone.com to get started! Joi Mebane: The Brow Architect (Celebrity Makeup Artist/ Entrepreneur) – Joi has been making waves in the beauty industry as a celebrity MUA and Brow Architect for years and now she is determined to share her business experience and expertise with others. 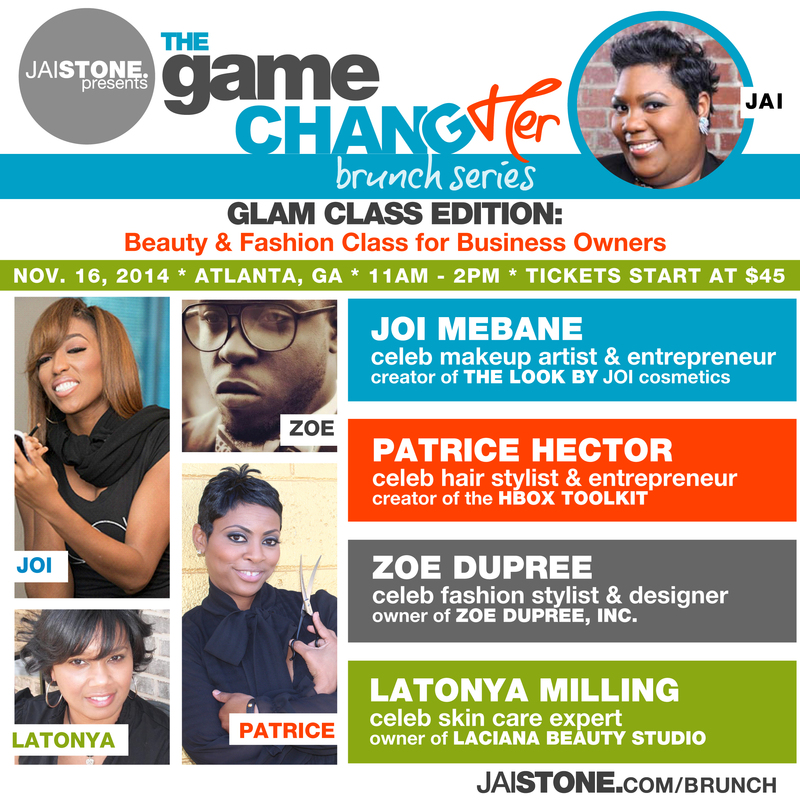 In addition to running her own cosmetic boutique store, Joi has her own cosmetic line (The Look By Joi Cosmetics) and is the author of the book Glam Executive. Please visit Joi’s WEBSITE or follow her on INSTAGRAM. Patrice Hector: The ULTIMATE Stylist (Celebrity Hair Stylist/ Entrepreneur) – Patrice is known all over the country for her precision hair cuts. But in addition to being an in-demand stylist she is also the creator of the H Box Tool Kit which houses tools for the ULTIMATE Beauty Pro. As a beauty industry trainer and educator, Patrice has a passion for teaching industry professionals the BUSINESS side of beauty! Please visit Patrice’s WEBSITE or follow her on INSTAGRAM. Zoe Dupree (Celebrity Stylist/ Designer) – Zoe can frequently be seen styling the Hollywood elite. His clients include The Braxtons, Selina Johnson, and Miaia Campbell to name a few. Mr. Dupree prides himself on being a trendsetter and pushing the fashion envelope to it’s tipping point. Check out his WEBSITE or follow him on INSTAGRAM. LaTonya Milling (Celebrity Skin Care Expert) – LaTonya is a licensed esthetician and total skin care professional who is passionate about creating effective skin care plans for your extensive list of clients. Her high profile client list ranges from music mogul Keith Sweat to C-level corporate executives, but her red carpet treatment extends to all her clients. Check out LaTonya’s WEBSITE or follow her on INSTAGRAM. Every woman in business needs to have a custom designed look captured with professional photos. 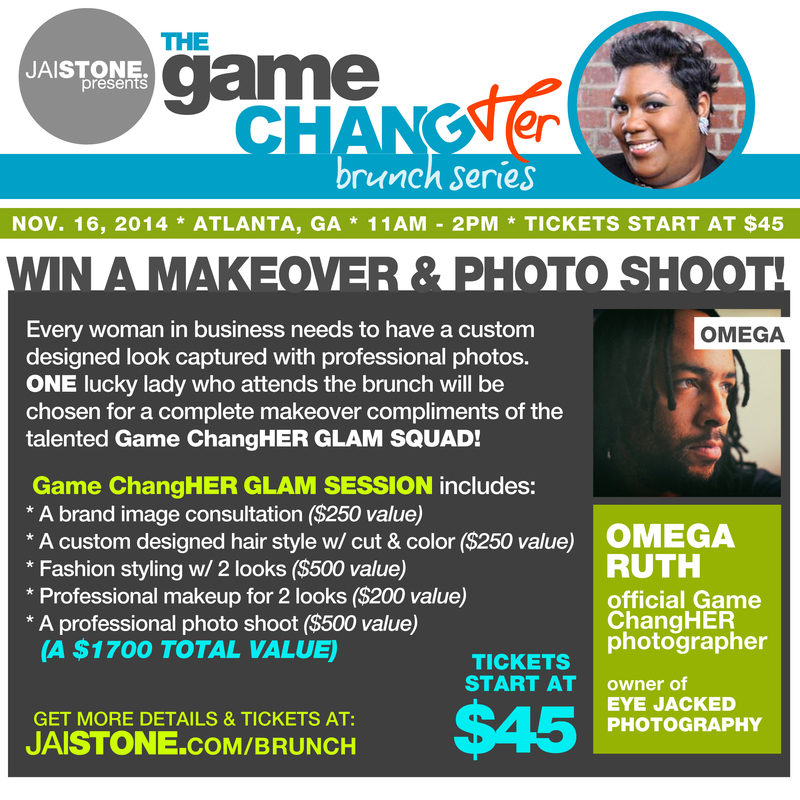 ONE lucky lady who attends the brunch will be chosen for a complete makeover compliments of the talented Game ChangHER GLAM SQUAD! I pride myself on offering a quality experience to all the brunch attendees. I also don’t skimp on the goodies. Here’s a list of things you get. Find out about future Game ChangHER events by joining my mailing list. My team of dedicated staffers help me keep the wheels up on this jet set lifestyle of mine. I'm enormously grateful to have them. J.S.